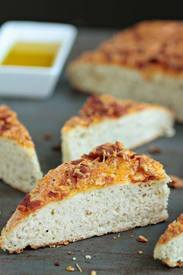 Bacon & cheese focaccia bread! Homemade bread can be quite intimidating, but I assure you that this recipe couldn’t easier – in fact, I’d even say that it’s pretty foolproof. This easy, cheesy focaccia is perfect for dipping in a little extra virgin olive oil or as a sandwich bread. However you decide to serve it, I promise it will be delicious. Besides, it has Bacon!